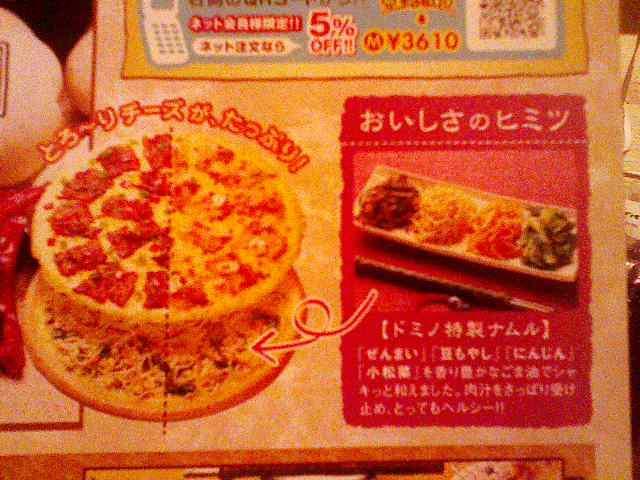 Domino’s Korean BBQ Japanese Pizzas « Japan, Hockey, Baseball, etc. 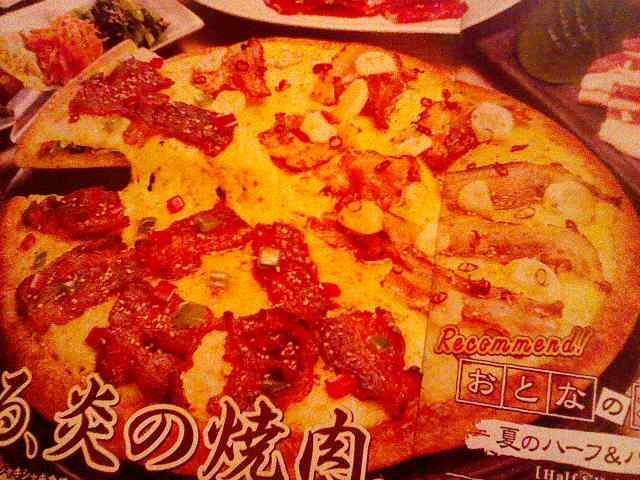 Domino’s in Japan has just upped the ante on weird pizzas with its new summer menu (the first Japanese pizza post). On it are double layer Korean BBQ pizzas where there is a layer of namul (various seasoned veggies) underneath the Korean BBQ beef and/or pork layer. 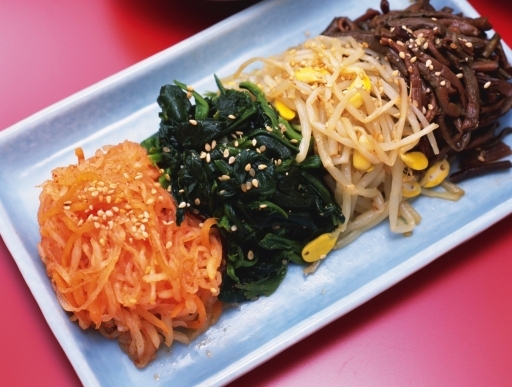 The popularity of Korean cuisine inspired pizzas in Japan continues to heat up. It’s a little difficult to tell with these grainy photos, but you can see the namul layer sitting below the Korean BBQ layer. This entry was posted on 2008 July 6日 Sunday at 1:17	and is filed under 02_English, culture, food, information, opinion, random, tokyo. Tagged: bbq, domino's, Japan, kalbi, korea, namul, pizza. You can follow any responses to this entry through the RSS 2.0 feed. You can leave a response, or trackback from your own site. I just returned from Osaka, Hiroshima and Tokyo… I would love to try this on my next trip. Where can I find it? Ha ha, that looks awesome! If it’s as good as their cheeseburger pizza from a few months ago, I’m defintely going to try it!